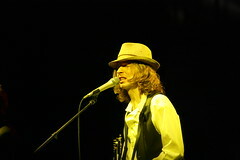 What a treat to see Beck’s peformance at Yahoo Hack Day last night! He had puppets, mashups, a dinner table and lots of great music. Lots of pics on Flickr.